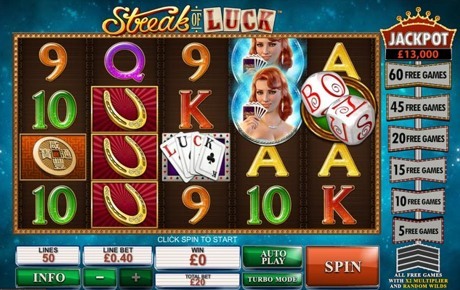 Streak of Luck is a 50-payline Video Slot featuring bonus round, free spins and progressive jackpots on 5 different bet sizes. Hit 4 winning spins in a row and light up the meter. Get a few more and see how a lucky streak can win you up to 60 Free Spins with random Wilds and double payouts, or even a progressive Jackpot! Have a go at the Dice Bonus and look for that streak of 7s to win up to 257 times your bet. The Dice Bonus is triggered by hitting a Bonus symbol on reels 1, 3 and 5 during the main game or Free Games. You are awarded 3 dice rolls. Roll the dice by clicking 'Roll'. Each roll awards a cash prize which equals the score on the dice multiplied by the current total bet. When the dice score is a double (e.g. two 3s, two 6s, etc. ), an extra roll is awarded, to the maximum of 6 rolls in total. There is an extra payout called Lucky 7s. Scoring 7 twice awards 20 times your total bet and scoring 7 three times awards 200 times your total bet. Non-winning spins reset the counter. In case of more than 10 consecutive wins, the counter is reset but will resume counting until a non-winning spin occurs. 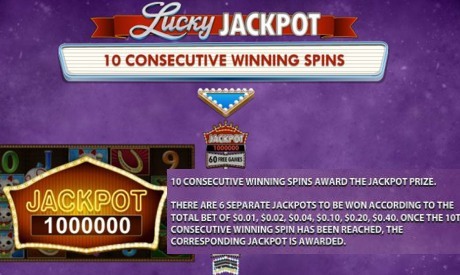 The Lucky Jackpot is a progressive jackpot triggered if the player gets 10 consecutive wins. Only wins received during the main game and the Dice Bonus count as qualifying for the jackpot. There are 6 separate progressive jackpots, one for each of the 6 fixed line bet denominations. You can change the denomination at any time. 1.40% of each bet goes into the Jackpot.